In late 2007, a five by seven foot section of weakened plaster fell from the 3rd floor ceiling of the main staircase at Chateau-sur-Mer and broke into thousands of fragments, narrowly missing recently-restored light fixtures, a chair and suit of armor on the landing between the second and third floors. The collapsed ceiling included an extension of the Tree of Life that is painted on the backside of the staircase—a free-hand painted lattice interlaced with foliage and the occasional bird and butterfly. 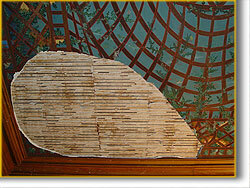 The ceiling painting dates to the 1870s renovation of the house by architect Richard Morris Hunt. The ceiling collapse was caused by a confluence of several events: leaking water over the decades, which damaged the plaster; significant structural cracking due to historic settlement of the building; and especially the fact that the original plasterers did not apply the plaster to the ceiling properly, failing to create enough "keys" to attach it to the support beams above and reducing its holding power. Broken plaster fragments were carefully collected so that conservation staff members could re-assemble the pieces to identify the pattern. After appropriate study, a proper treatment was identified, including re-plastering the area, correctly compensating for the lost decorative paint, even replacing the broken fragments. A substantial scaffolding was built to allow access to the ceiling for further study and treatment, and to support the remaining ceiling areas to prevent further loss. Carpenters also opened the flooring above the damaged ceiling to allow access for study and repair. In 2011, the repair and re-installation of the damaged section of ceiling was completed. Starting with small shards and fragments of painted plaster, conservation staff members and interns gradually matched the pieces into larger segments, then those segments into increasingly larger sections. Those sections were further patched and in-painted where losses existed. 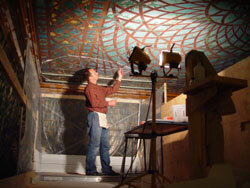 The larger pieces were re-installed in the missing 5x7 foot section of the ceiling. Additional patching and in-painting was done on site to complete the repair. 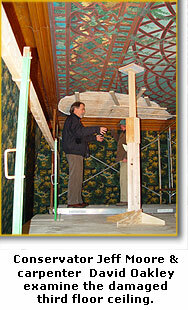 At left, conservation assistant John Bartosh re-attaches pieces of the painted plaster to the ceiling.